Borago officinalis or starflower is native to the Mediterranean region and has naturalized in many other regions. Like the Dandelion and most other weeds, it remains year after year by self-seeding. They grow to a height of about 60–100 cm (2.0–3.3 ft) with leaves about 5–15 cm (2.0–5.9 in.). The flowering season is pretty long which also contributes to the continuation of the vitality, ranging in most areas from June to September. As I continue on this series of exploring and looking closer at the most common weeds, I hope to give a greater appreciation to our natural resources. Traditionally, Starflower cultivated for culinary purposes used as fillings, soups, and sauces used as a vegetable or as a spice. As a fresh vegetable taste a lot like a cucumber. Additionally, the flower is also edible and used in cocktails, teas, desserts and as a treat to children as a candied flower. Starflower is very low-calorie food. 100 g of fresh leaves carries just for 21 calories (2). For the calorie value, this plant is packed with important phytonutrients, minerals, and vitamins. Essential fatty acid γ -linolenic acid (GLA) (Omega- 6 fatty acid, typically in concentrations of 17-20%. Fresh borage herb has high levels of vitamin C (ascorbic acid); provide 35 mg or 60% of RDA per 100 g. Vitamin C (2). Starflower herb is one of the rich sources of vitamin A (140% of RDA) and carotenes (2). The herb holds a good amount of minerals like iron (41% of RDA), calcium, potassium, manganese, copper, zinc, and magnesium (2). The herb is one of the moderate sources of B-complex vitamins, particularly rich in niacin (vitamin B-3). Niacin helps lower LDL cholesterol levels in the body (2). Wash fresh herb in cold running water or rinse for a few minutes to remove any dirt or pesticide residues. The herb can be used in large quantities like other green vegetables. Remove tough leaves and stem using a paring knife (2). The importance of not using herbicides and pesticides on your lawn is so essential. Additionally please note not to pick these plants for culinary purposes unless you’re sure of lack of chemicals. Consequently, I am not a dietitian or a doctor so please advise a professional on nutrition benefits. Please consult a doctor because the herb contains certain compounds in it which when taken in large quantities may affect kidney functions (2). Companion planting in gardening and agriculture is the planting of different crops in proximity for any of a number of different reasons, including pest control, pollination, providing habitat for beneficial creatures, maximizing use of space, and to otherwise increase crop productivity. Companion planting is a form of polyculture (3). Permaculture goes hand and hand with companion planting and should be a part of your design. Observing and understanding when a plant thrives when paired with another element such as another plant, tree or animal is key. 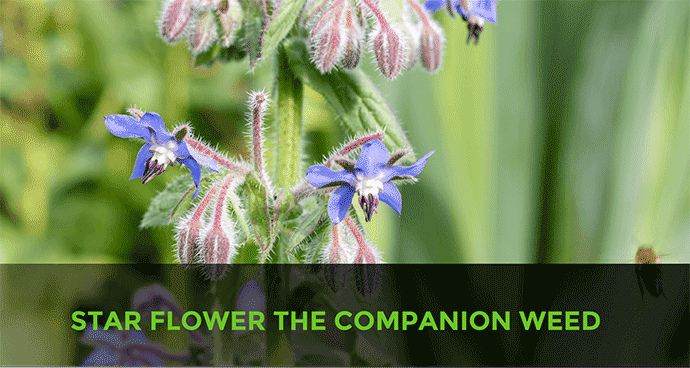 The Starflower is a great companion for strawberries, tomatoes, and squash. The bees love the bloom so that helps with pollination. The blooms will also attract wasps as a pest predator. Starflower has been known to repel the tomato hornworms and cabbage moths. Additionally, dead leaves become great mulch to further aid the soil. Companion planting is a vital part of any effective design because it can put different plants together that have different nutrient requirements so less depletion on your soil. Putting companion plants together makes somewhat of a natural barrier against pests and diseases because it’s not the same plant in a big space spreading. Having a well-designed Permaculture Design makes for a sustainable food garden in every plot. Please stay tuned for more on our Weeds Series and Our Upcoming World Permaculture Association Permaculture Design Course in February of 2019. I have a friend who wants to share this delicious recipe with our community that includes…. Yes, you guessed it Pumpkins!